Just need a part? Click here for our appliance parts website with over 5 million parts in stock- NEW! We are the leader in Refrigerator and Appliance Repair in the Houston/Dallas/Fort Worth and surrounding areas. We offer same day appliance repair on most appliances. All our technicians are factory trained, friendly, reliable, on time and ready to service and repair your appliance today. We stock a huge inventory of appliance repair parts to fix your appliance on the spot! Call today for appliance repair service! Houston, TX | Katy, TX | Sugar Land, TX | Spring, TX | Woodlands, TX | Clear Lake, TX | Pearland, TX | Conroe, TX | Kingwood, TX | Porter, TX | and more! Update: 01-30-2012, We have expanded our appliance repair services to Dallas, TX including Arlington| Grand Prairie | Irving | Duncanville | Euless | Bedford | Pantego | West Dallas | Fort Worth and surrounding areas! See the news tab for details. Our service charge is only $47.50* (free with repair) to have a factory trained appliance repair technician come to your house or place of business. Our company is insured, locally owned and family operated. You may schedule your appointment online by clicking here. Same day service on most appliance's for repair service scheduled before noon. *Does not include Holidays or Sundays, call for more info. 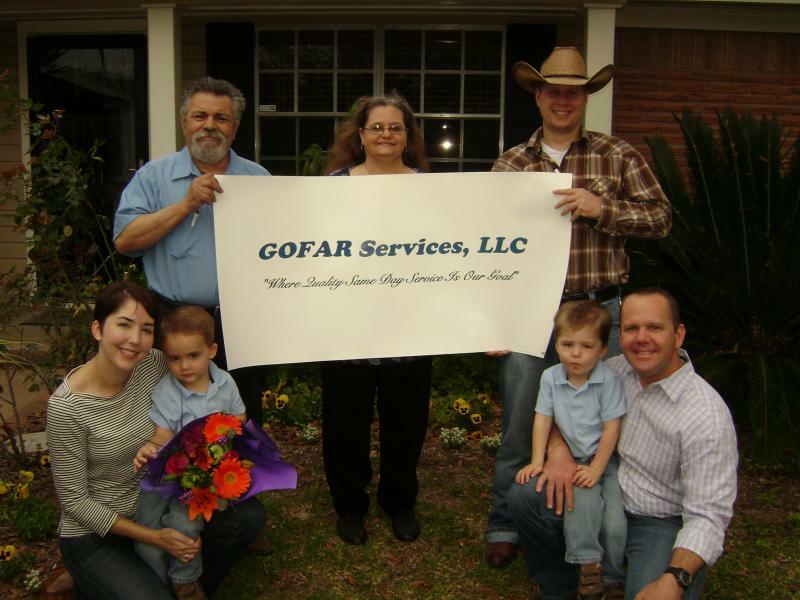 Congratulations to the Cook family (seen below with GOFAR Services, LLC employees) who had their appliance fixed for free! Click here for more details in our "Appliance News" section.